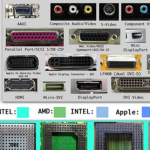 Technibble.com shows you a wall chart view of all the parts in your computer and what they’re called. (Click twice to expand.) Like, what are those different connectors on the back for? And how can I tell the difference between a parallel port, a serial port, Firewire, USB, and all that other stuff. Interesting.